We love Halloween! From the children trick or treating, to streets lined with pumpkins. But how did it start? Origins date back to the Celtic festival of Samhain. The Celtic people who lived over 2,000 years again what is now referred to as Ireland and parts of the United Kingdom. They celebrated their new year on the 1st of November. The day marked the end of the summers harvest, and the beginning of the winter. It was a time of year that was often connected with human death. The Celtic people believed that on the night before the new year, the boundary between the world of the living and the land of dead became blurred (scary right?!). On the night of October 31st the people celebrated Samhain (This was believed to be the time that ghosts returned to earth). In accumulation to causing havoc and damaging crops, they believed that the presence of the spirits made it easier for their leaders to make decisions about their future. As the people back then were entirely dependent on the what they believed to be a volatile natural world, the prophecies were an invaluable source of comfort and reassurance during the long, dark winter. All year around we have the delight of supplying our Extras to various exiting campaigns. 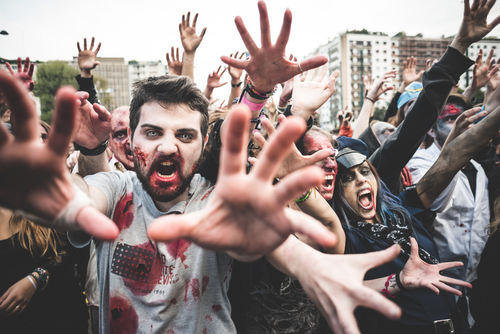 But nothing can be as exciting as a ZOMBIE FLASH MOB! Our client was looking to capture the public (who had been set up) by surprise for a televised commercial. Rent A Crowd were tasked with suppling a crowd of 40 people Zombies to lurk in and around a shopping centre. On this occasion it was necessary to ensure that the crowd were trained on how to act like a zombie (staggered walking, twitching head and a deathly stare!). A few heart attacks and release forms later our client was delighted with the results! If you are looking for a crowd of extras for spooky events or have crowd requirements over the Halloween period, we would be delighted to hear from you. Please call us on 08448 000071 or click here so send us details of what you need. How to break into acting, here are some handy tips!